What year did this start in? My 97 does not have this, correct? yes, your 1997 Accord has an ELD. the ELD will shut off your alt, causing your voltage to drop to battery, 12-12.5V. you can witness this by turning off fans, lights, A/C, etc. and watch the voltage while driving (city or hwy doesn't matter). when the voltage drops suddenly, turn on your A/C and the voltage will jump back up. that is the ELD at work. documents i have with the ELD date back to 1991 in almost all Honda's. Last edited by keep_hope_alive; 06-03-2011 at 05:26 PM. Great info! By any chance do you happen know if this is all still applicable to a 2003 Accord (7th generation, vs your '01 being 6th gen), i.e. still want a 820 ohm resistor? 820 ohm worked for me, should be universal, but measure voltage just to ensure you get sufficient drop. A volt meter in the car is a good idea. Last edited by Sadus; 09-08-2011 at 12:01 AM. The ELD is a fuel saving measure. It is another input for the ECM for alternator field control. I agree having it on all of the time should be fine. I just like the option of increasing mpg when possible. In a new carn this mod is llikely to void your warranty. 820 ohms is a standard value that gave me the necessary voltage drop. I have the dreaded flickering of headlights on my 2008 Honda Accord when the A/C is running. The headlights don't flicker in any other scenario. Can I just disable the ELD? I googled the following: "Disconnecting the control wire from the alternator will disable the ELD control of the charging system, thus allowing the alternator to charge normally. The most important thing to remember when testing the charging system is to be sure to add an electrical load (such as headlights)." I think the fuel saving design is fairly bogus since my mpg hasn't broken 30 mpg on the highway. It's also dangerous because it appears as if you are flashing other drivers. Last edited by tradosaurus; 09-08-2011 at 07:13 AM. I've seen this "feature" on several cars in the family over the years. The dimming of the headlights is pretty minor. You can see it easily, but it sure doesn't look like flashing. The brightening/dimming that you see from going over a bump in the road is much more pronounced. If yours dims so severely that it actually looks like flashing, then maybe something else is going on. All I know is the 2008 Accord ELD function makes the dimming very noticeable. So much so that 3 people in George had the state FORCE Honda to buy back their vehicle because of this one design flaw. I'm just trying to eliminate the design flaw if possible if the Texas DMV doesn't accept my complaint form. But you didn't answer the question whether "unplugging" the ELD will cause any other issues. 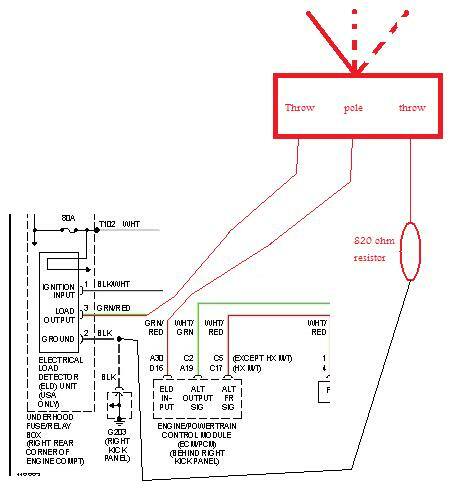 unplugging the ELD can confuse the PCM/ECM which can cause it to throw error codes. The exact effect on every make/model is unknown. (1) 20A 12VDC relay, with 12VDC coil and N.O and N.C. contacts (5-pin) – I recommend getting a 5-wire socket with it. Approximately 10 feet of 18awg wiring – each 10 ft. in three colors for a total of 30 ft. I found that 10 feet of 18-4 CL2 speaker wire works great. Anyone care to give a recommendation of a nice online electronics parts site where I could easily find all of this? Even better if they also have any tech flex and/or high-temp split loom and/or AWG 1/0 wire for the big 3 too. Last edited by Sadus; 09-10-2011 at 01:14 AM. First off, thanks for making this thread and helping everyone out with this issue regarding the ELD circuit. Definitely helped a ton! also does this look good as far as wiring the switch?